There is a date for the much anticipated and highly speculated press conference for the Conor McGregor/Khabib Nurmagomedov showdown for UFC 229. Brett Okamoto of ESPN reports that the press conference is set for next Thursday, September 20th, at Radio City Music Hall in New York City. The event will not be open to the public and is for media only. This will be Conor McGregor’s first press appearance since the tour for his money fight with Floyd Mayweather last year. Khabib Nurmagomedov and Conor McGregor will both attend a UFC press conference next Thursday at Radio City Music Hall in NYC. The Conor McGregor/Khabib Nurmagomedov bout was officially announced at the UFC 25th Anniversay Press Conference. Since then, the only promotion for the event have been posts on the UFC’s social media platforms. 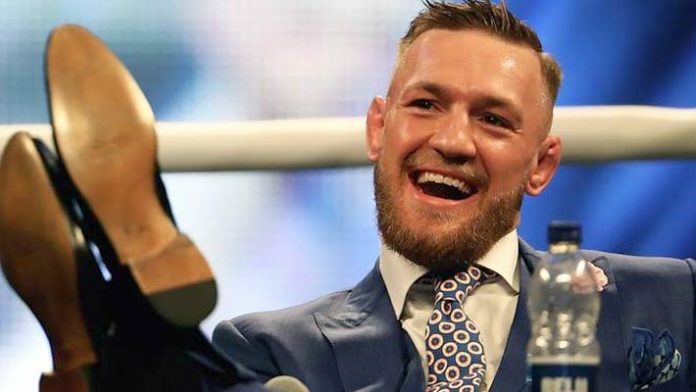 Dana White has stated that the promotion had some “fun stuff” planned for the UFC 229 promotion, and there has never been a McGregor press conference that was anything less than fun. Conor McGregor last competed in November 2016 where he became the champ-champ with a second-round TKO over Eddie Alvarez to become the new lightweight champion. The next time McGregor would emerge in competition was when he attempted to snap Floyd Mayweather’s undefeated 49-0 boxing record but came up short. As for the champion, Khabib Nurmagomedov, he last competed in April at UFC 223 when he defeated Al Iaquinta for the vacant lightweight championship. Khabib will be the second consecutive undefeated opponent that McGgregor has competed against. All told, the combat records of McGregor’s last two opponents at the time of the each fight is 75-0. There is less than one month before McGregor again tries to hand a dominant competitor his first loss, but the verbal battle is all set to begin next Thursday. Who do you think will when the verbal battle at next Thursday’s press conference?